While in port, explore Skagway's local highlights and the White Pass Summit during this 2.5 hour mini-bus sightseeing shore excursion. Travel along the Klondike highway with sweeping views of coastal rainforest cloaked mountains and rugged mountain valleys. 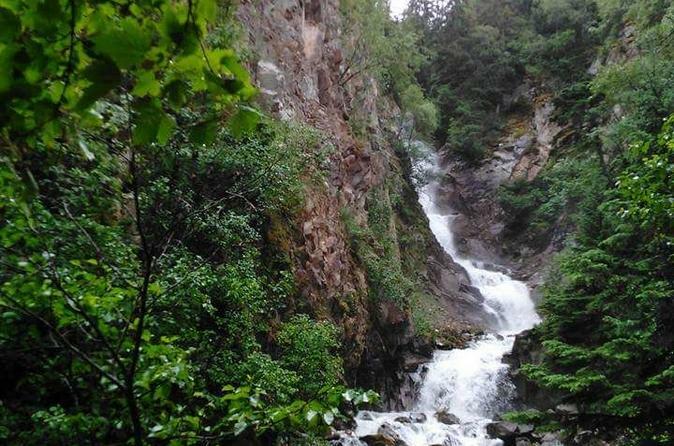 Stops include waterfalls and a classic photo at the ‘Welcome to Alaska’ sign. Breathe in crisp mountain air near the Summit and sweeping dramatic views at Tormented Valley. Along the way, hear entertaining tales of the 1898 Klondike Gold Rush narrated by your experienced guide. After port pickup, your 2.5-hour shore excursion begins with a city tour of Skagway. At the Skagway City Overlook, enjoy bird’s-eye views of the town, harbor and cruise ships. Against the backdrop of mountains and rain forests, see historic landmarks including the WP&YR railroad, Moore Creek Bridge, Brackett Wagon Road and Pitchfork Falls. Your informative guide shares tales at the Klondike Gold Rush Cemetery — hear about Frank Reid, ‘Soapy’ Smith and the gunfight that forever transformed Skagway. Next, speed along the Klondike Highway, which parallels the White Pass Railroad and White Pass Trail, and listen to stories of the Klondike Gold Rush. As waterfalls, mountains and glaciers pass within view, imagine hopeful prospectors crossing this unforgiving terrain. Ascend an elevation of 3,292 feet (1,003 meters) before reaching Tormented Valley, a desolate lunar-like landscape of 300-year-old trees and alpine tundra. Traverse the valley and then stretch your legs at Summit Lake. Take in the beautiful but harsh wilderness in the White Pass Summit Area that inspired writers like Robert Service and Jack London. 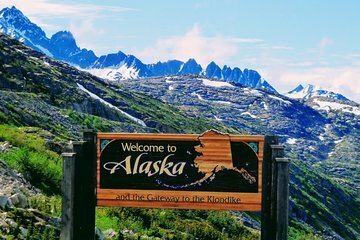 En route back to Skagway port, stop at the iconic ‘Welcome to Alaska’ sign and snap a commemorative shot of your journey.